Hey Fellas! Hope you are getting along with life pretty well. The above calculator is a representation of Fahrenheit to Rankine Converter. You can put any value in Fahrenheit temperature scale, it will convert it to Rankine scale in a single click. You need to convert temperature from one scale to another based on the nature of the experiment you are carrying out. The given formula will help you understand the calculation behind the conversion. Following formula is used for conversion from Fahrenheit to Rankine temperature scale. Convert 120 Fahrenheit to Rankine. Just put the values in the formula. 120 Fahrenheit temperature is equal to 579.67 in Rankine temperature scale. 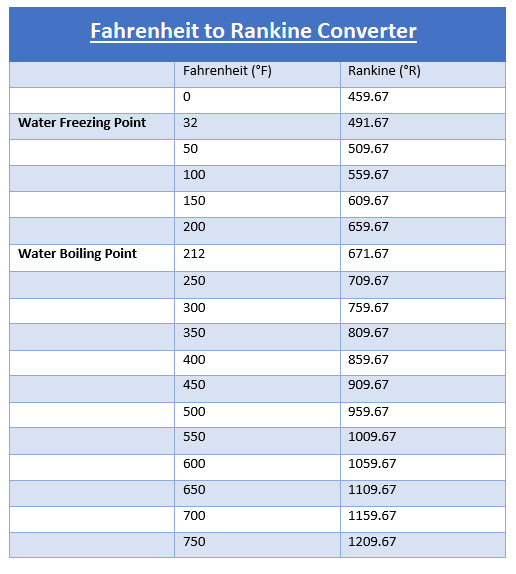 Following table shows some common values used for Fahrenheit to Rankine conversion. Fahrenheit can be defined in terms of water boiling and freezing point where it boils at 212 ºF and freezes at 32 ºF. It is important to note that, all these values in Fahrenheit and Rankine scales are calculated and measured at sea level using standard atmospheric pressure. Fahrenheit is a temperature scale named after German physicist Daniel Gabriel Fahrenheit who proposed this scale in 1724. He did an experiment on the ice-salt mixture and concluded that normal body temperature is around 90 ºF and water freezing point is 30 ºF. As he furthered his experiments, he found the concluded values for water freezing point and normal body temperature were not accurate. These values were adjusted, later on, pointing out 32 ºF as the freezing point of water and 98 ºF as the normal body temperature. Rankine temperature is defined as the absolute scale of thermodynamic temperature. It is denoted by ºR. This temperature scale was introduced by William John Macquorn Rankine in 1859. Based on his contributions to the temperature scale, scale was named after him. You can see from the table given above, zero Fahrenheit is equal to 459.67 on the Rankine scale. The water freezes at 32 ºF or 491.67 ºR and boils at 212 ºF or 671.64 ºR. It is true Fahrenheit and Rankine scales don’t share a common point and 0 ºR is equal to -459.67 ºF, however, these values increment gradually with the same factor once they are made equal with some offset be added in the start. The 0 Rankine is also known as absolute zero – the lowest temperature at which the particle motion seizes to flow. More often than not this temperature is based on theoretical value and is not practically possible to achieve this temperature. Rankine is mainly used in a variety of engineering systems involving heat commutations. That’s all for today. I hope you have found this read valuable. If you are unsure or have any question, you can drop me a comment in the section below. I’d love to help you the best way I can. Feel free to keep us updated with your feedback and suggestions, so we keep providing quality content as per your requirements and you keep coming back for what we have to offer. Thanks for reading the post.